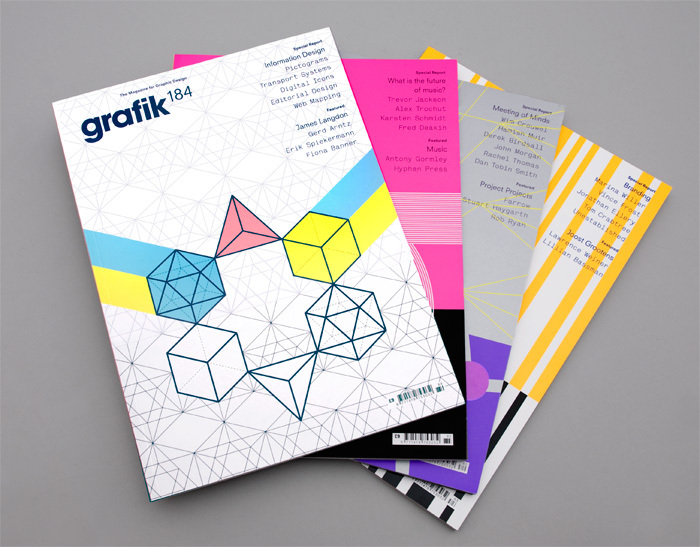 Following the summer 2009 redesign of Grafik, a second cover series was introduced in early 2010. The issue 182—185 cover series featured a dividing line which split the illustration into two interplaying fields. Used as a device to tie the series together and establish a visual language on shop shelves, the divided areas referenced scientific, micro to macro diagrams, as well as the conventional horizon line used in painting and photography. Following the summer 2009 redesign of Grafik, a second cover series was introduced in early 2010. The issue 182—185 series featured a dividing line which split the illustration into two interplaying fields. Used as a device to tie the series together and establish a visual language on shop shelves, the divided areas referenced scientific, micro to macro diagrams as well as the conventional horizon line used in painting and photography.